I couldn’t believe it when I saw the headline in my Facebook feed. British actress Elisabeth Sladen, best known for her role as The Doctor’s intrepid companion, Sarah Jane Smith, on Doctor Who, passed away today at the age of 63. Sladen had been battling cancer for quite some time, but had managed to keep her condition private. She leaves behind a husband, actor Brian Miller, and her daughter, Sadie. 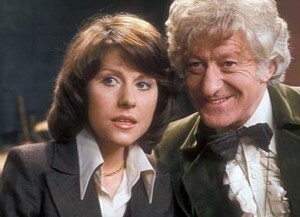 Sarah Jane and the Third Doctor (Jon Pertwee). Sladen made her debut on Doctor Who in 1973 as Sarah Jane Smith, a journalist and companion for the Third Doctor, played by Jon Pertwee. She went on to star in three and a half seasons of Doctor Who, working with Pertwee and his successor, the illustrious Tom Baker. 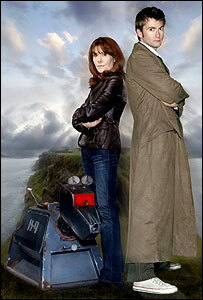 Sarah Jane is arguably the most popular companion in Doctor Who cannon, so popular that when Doctor Who was revived by Russell T. Davies in 2005, Davies not only elected to bring back Sarah Jane for a reunion with the Tenth Doctor during David Tennant’s inaugural season in popular Series 2 episode “School Reunion,” he ended up producing a series centered around Sarah Jane as well. The cast of “The Sarah Jane Adventures” in 2008. The Sarah Jane Adventures aired for four seasons, from 2007-2010 and was a more light-hearted spin-off geared toward younger viewers in which Sarah Jane, aided by a trio of teenagers, foiled extraterrestrial attempts to take over the Earth. The series crossed paths with Doctor Who on several occasions, with both Tennant and Eleventh Doctor, Matt Smith, making appearances on TSJA. The show was honored with the 2010 RTS Award for best children’s drama. News of Sladen’s passing comes just as the premiere of Doctor Who: Series 6 is mere days away on both the BBC and BBC America. I hope that the producers will take a moment to acknowledge the loss of Sladen and all that she’s meant to Doctor Who and her fans. Doctor Who holds a very special place in my heart because an episode of Doctor Who meant time spent with my father, no matter that the show came on at 11pm, way past my bedtime. The first episode I truly remember was Pertwee’s swansong, “Planet of the Spiders,” where Sarah Jane became possessed by spiders of Metebelis III. At a point where positive female role models on science fiction/action-oriented shows were in short supply, her intelligence, courage and devotion to the Doctor made a lasting impression. Sladen played Sarah Jane with grace and wit, portraying a wonder and vulnerability that never degraded to dependence in her travels with The Doctor. When she returned to the role after more than 20 years, she brought a maturity and wry resignation about her age that couldn’t quite hide the fact that she clearly relished being back in Sarah Jane’s skin. And age be damned – Sladen had Sarah Jane running circles around Rose Tyler without breaking a sweat and had Capt. Jack panting after her like the shameless omnisexual he was (and rightly so). All while protecting the planet and raising a genius teenaged son on her own. 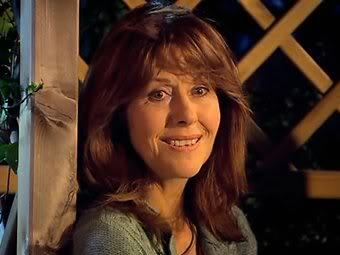 So thank you, Elisabeth Sladen, for the years you devoted to Sarah Jane and the example that you set for women like me. Your portrayal of Sarah Jane showed us that women could be more than mere tag-along sidekicks and that women can admit to fear without being weak. By giving life to Sarah Jane after her journey with the Doctor ended, she demonstrated life doesn’t have to end when you lose the man of your dreams – sometimes that’s just the beginning. This entry was posted in TV/Film and tagged companions, Doctor Who, Sarah Jane Smith by Michi Trota. Bookmark the permalink. Good Article. But Lis was 65 when she died. She was born on 2/1/46.